Come with me now, back to the seventies. Paul Smith and I are sitting in our office at Collett, Dickenson and Pearce, the advertising agency. Suddenly, the looming presence of Frank Lowe, the agency’s managing director, makes itself felt. (Frank did a lot of looming in those days.) In his hand he has a script we’d just written for Jif Dessert Toppings, a range of ready-made sauces designed to liven up otherwise everyday deserts such as semolina. ‘Did you do this?’ enquired the Great Man. ‘Yes’, we ventured tentatively. You never knew where this question would lead with Frank. It could be good: ‘it’s rather nice, isn’t it’. Or bad: ‘I think it’s terrible’. On this occasion Frank’s opinion fell somewhere in between. ‘I’ve read this script. It starts off rather well, but it rapidly goes downhill after that. Do you think you could write something else, something better?’ With which, the Looming Presence left. What to do? Obviously, we had to write another script. In the CDP of the seventies, Frank was master of all he surveyed, God on High in the firmament of the agency. It was Paul who came up with the idea that would save us from his wrath. ‘Why don’t we do something using Thunderbirds?’ Talk about International Rescue, it certainly rescued us. In no time at all, we’d written a new script, one that we considered to be far better than our previous effort. Above all, one that was likely to pass the steely gaze of Frank Lowe. And so it proved. A few weeks later we found ourselves at Elstree Studios filming three puppets with Gerry Anderson and David Lane, director of many episodes of Thunderbirds. The action then moved to Bray Studios, where we shot the moonscape and space sequences, again using members of Gerry Anderson’s regular crew. We were as pleased as punch with the finished commercial. So much so, that we entered it into the Design and Art Direction (D&AD) award scheme. At one point in the judging the film was in contention for the silver award for best 45-second commercial of 1977, until one of the jurors, Ridley Scott, no less, stepped in. According to fellow juror, Terry Lovelock, Ridley said that the jury couldn’t possibly give the Jif film an award. ‘It’s the worse looking commercial I’ve ever seen’. It was relegated to an entry in that year’s D&AD annual. Jif Dessert Toppings may have missed out but Paul and I didn’t. Another commercial we’d entered, the David Bailey ‘Wedding Photographer’ film for Olympus Cameras won the award instead. So at least we were happy. Now let’s fast-forward to 2016. 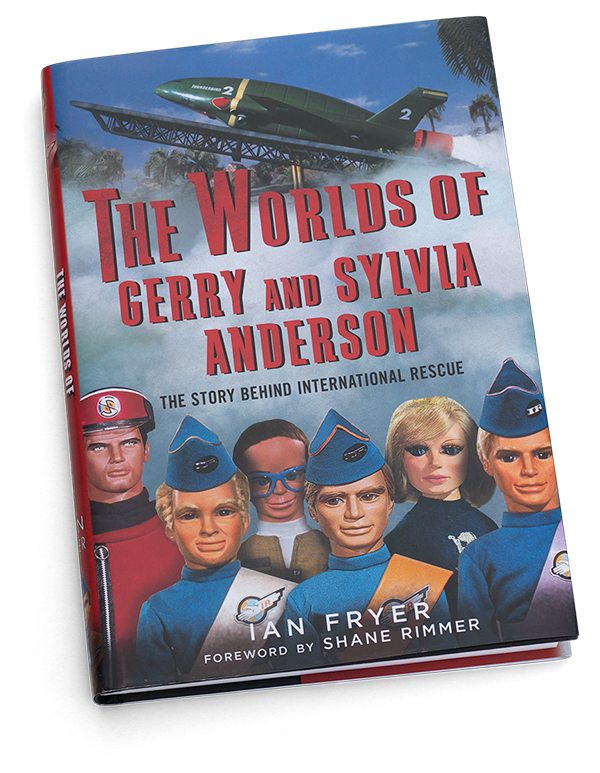 Ian Fryer, a film historian and writer, publishes a book called The World of Gerry and Sylvia Anderson, the story behind International Rescue, and do you know what? In the final chapter of the book, not only has Ian Fryer name-checked Paul and me, but he tells us that the Jif Dessert Toppings commercial was the last-ever outing for Supermarionation, the word that Gerry and Sylvia Anderson coined to describe their filming technique using puppets. Incidentally, talking of puppets, there’s a postscript that might tickle you. Paul and I did a trade ad to accompany the film to appear in publications such as The Grocer. By this time the puppets were in Blackpool. We trooped up the M6 with Alan Brooking, the photographer, to take their picture. The puppets were on show in an exhibition in the seaside town – not for long, though. A week or so after our visit they were stolen, never to be seen again – unlike the commercial, which makes regular appearances on YouTube and, at the moment, can be seen here: Gerry Anderson Jif Dessert Toppings (Alien-Attack).